HO CHI MINH CITY, VIETNAM / ACCESSWIRE / August 21, 2017 / Vietnam is one of the most appealing destinations in Southeast Asia. With dramatic landscapes, beautiful beaches, nation's long history and tasty food, Vietnam has impressed a lot of foreign visitors. As a result, in the first 7 months of 2017, the number of international arrivals to Vietnam has increased 28.8% over the same period last year. British travelers with a visa Vietnam make over 200,000 visits to Vietnam each year to enjoy the peaceful atmosphere as well as beautiful places. There are a lot of things to see and do in Vietnam. Travelers do not need to worry about not knowing how to set up their travel itinerary, because the Green Visa agency has introduced a list of interesting places which they can travel to while staying in Vietnam. Ho Chi Minh City is located in the southeastern region of Vietnam. This place is known to be the most dynamic city with a lot of skyscrapers, shopping malls as well as excellent cuisines which contain a range of flavors and tastes. Ho Chi Minh City, formerly Saigon, has been drawing a huge amount of travelers each years due to not only its energy but also the historical heritages such as Dinh Doc Lap (Independence Palace) where the President of South Vietnam lived and worked during the Vietnam war, or Bao Tang Di Tich Chien Tranh (War Remnants Museum) which paints a disturbing picture of the brutality of war and many atrocities committed by US Forces during their Vietnam campaign. Situated in Lam Dong province – part of the Central Highlands of Vietnam, Dalat is called "the City of Flowers' with its fresh air, misty valleys and a lot of breathtaking waterfalls. Once being used as an ideal destination to relief the heat of Vua Bao Dai (King Bao Dai – the final emperor of the Nguyễn Dynasty) and a lot of French colonials, Dalat still remains a beautiful scene of French architecture surrounded by a cool and romantic atmosphere. For those reasons, Dalat has becoming one of the most charming destinations that visitors must take a trip to. Hoi An is an ancient town located in the south central of Vietnam. This destination is well-known with international tourists by its silently charming atmosphere, historic architectures as well as traditional culture. Once visiting this beautiful spot, travelers may come across many ancient-style houses and hundreds of shopping store where they can find a lot of traditional souvenirs and custom-made services. It is recommended that travelers should visit Hoi An, ancient town from January to August as this period has an ideal weather condition. Positioned in the Northeast of Vietnam, Ha Long Bay is recognized as a UNESCO world heritage which has a coastal ecosystem with aqua-green water and many fascinating limestone islands. Tourists may spend about four to five hours on traveling from Ha Noi to Ha Long Bay by bus. All in all, Ha Long Bay is an ideal place for visitors who want to admire natural and magnificent landscapes. 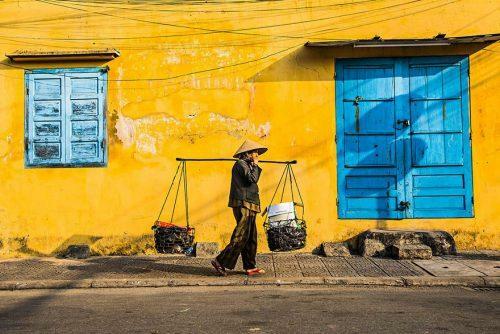 In recent years, Vietnam and Southeast Asia have become new ideal destinations for many backpackers. Vietnam aims to welcome 11.5 million foreign tourists in 2017. The U.K. has been one of the most rapidly growing markets, partly thanks to the visa waiver policy. Despite the increasing number of British tourists coming to Vietnam each year, some of them feel inconvenient with the complicated procedures of getting a Vietnam visa UK at the Vietnam Embassy. To ease this problem, the Vietnamese government decided to launch a new visa system called Vietnam visa on arrival (VOA) allowing travelers to obtain a visa to Vietnam at the arrival airport in Vietnam. Currently, there are many travel companies concentrating on handling Vietnam visa on arrival services, and Greenvisa is one of the most prestigious firms that can help visitors acquire a visa on their behalf. Green Visa Vietnam service guarantees to assist foreign tourists in eliminating the hassle of getting into trouble with visa procedures at the embassy and collecting Vietnam visa online before their Vietnam visit.